The phrase "go west, young man" is one that's traditionally used to talk about the natural course of America's expansion, but here in North Texas the phrase "go east, brewer man" might be a more appropriate adage, considering the last two breweries to open in our area have done so near the region's eastern border. 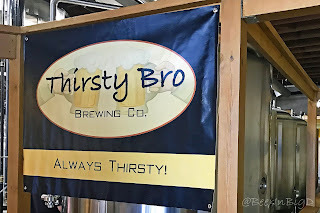 One of those is Thirsty Bro Brewing Co., which held its grand opening on Saturday in Royse City. Founder Terry Gordon and wife Catherine have been welcoming visitors on a soft basis here and there since late December, but this past weekend was the first time Thirsty Bro was officially open to the public. Saturday's festivities included live music and, of course, beer - both of which were enjoyed in the brewery's intimate space, which essentially anchors one end of the city's downtown district. On tap for the occasion were five Thirsty Bro recipes, including the flagship Gettin' Figgy Wit' It, a pale ale brewed with fig and apricot that Gordon says has been his most-requested beer so far. Also available were Licking Dog Porter (chocolate and licorice), Big Bro Breakfast Stout (oatmeal, raisin and cinnamon), Brother's Keeper IPA (Citra hops, orange and anise), and Bro'd Trip IPA (British malt). Thirsty Bro beers will feature a variety of ingredients, including fruit, nut and spice infusions (© Brian Brown/Beer in Big D). That's just the starting lineup, though, as Gordon plans to serve upwards of 12 beers on a regular basis (click the image above for a full list, including ingredients and ABV/IBU where available). "We're going to have eight regulars and four rotators," says Gordon. "One of the rotators will be unique in that we'll do a kind of homebrew spotlight beer with someone from the Royse City Homebrew Club." Production of those beers is currently being done on Gordon's pilot system. While his 15-barrel production brewhouse was delivered in November, Gordon says he's still working with the city on a couple of issues on how it'll be set up inside the space. Originally, the plan was to open after getting everything installed, but delays got to a point where he had to make choice as to whether to wait it out or push forward. "We're about five months behind where we wanted to be in terms of getting up and running," explains Gordon. "Sooner or later you have to get open, though, so we decided to start with the first five brews being made on the pilot system. We'll keep those on full time and work in small batches of the others every few weeks." What that limited output also means is that the taproom will only be open on Saturdays from 12-11 p.m. initially, with hours on Thursday, Friday and Sunday being added once full production is underway. * Click here for more on the brewery and the story behind its name. Labels: new breweries, recap, Royse City, Thirsty Bro Brewing Co.